Ballard & Snoqualmie RR "Gateway to Edmonds and points North"
I joined Mt. Rainier N Scale in about 1994, just in time to gear up for the 1995 Washington Fair appearance. 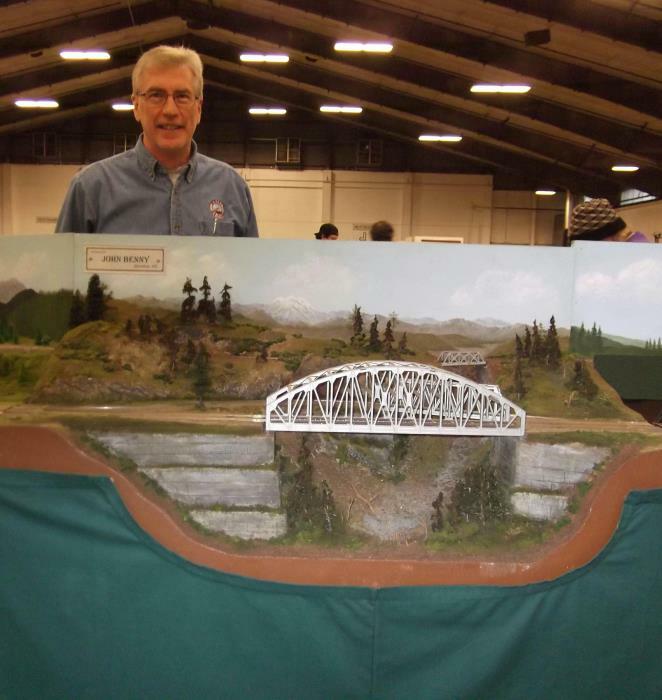 Most recently, the club traveled to the National Train Show in San Jose, our first national appearance. Running trains with the Big Kids was a real thrill; knowing that our modeling compared favorable was even better. 2) If it's not prototypical, refer to rule one. Second rule: "Red on Red, Black on Black" (thanks to Mark C). Serving as the "Sparktician" for Mt. Rainier has given me the opportunity to learn prototypical operations and apply them to N Scale. It's only 12 VDC, so when the smokin' dead short happens, it's usually not fatal. On Scenery: The material is cheap, if you don't like it, scrape it all off and do it again (which I've done several times). Also, when you've run out of Younkinite, you're done for. (Ask Jim Younkins, Chief Landscape Officer). I think I've always loved trains and "mechanical stuff". I started with a Marx set as a boy, then HO as a teen. 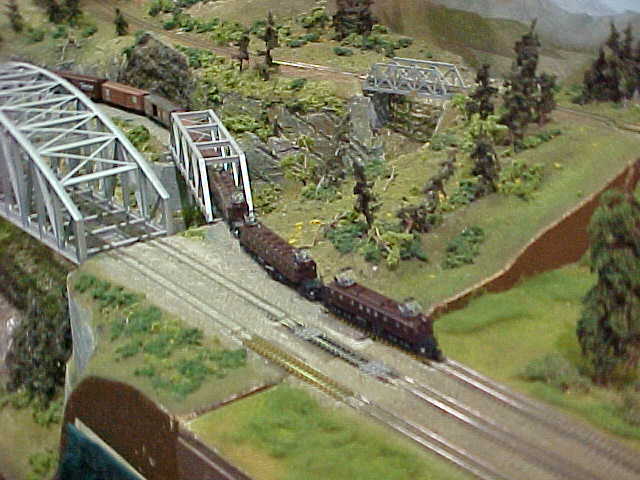 When I returned to the hobby, I picked N Scale. My first N Scale layout was a 2 x 5 designed to fit in an apartment closet. That was 1970 and the trains went round and round when (and if) the Roco engine ran. My first N-Trak module was built for the 1983 Pacific Science Center Show in Seattle. It was retired a couple of years ago. A final view is shown below.